The invention of metal detecting technology during the Second World War allowed the development of a hobby that has traditionally been vilified by archaeologists as an uncontrollable threat to the proper study of the past. This book charts the relationship between archaeologists and metal-detector users over the past fifty odd years within an international context. 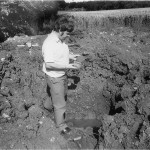 It questions whether the great majority of metal-detector users need be seen as a threat or, as some argue, enthusiastic members of the public with a valid and legitimate interest in our shared heritage, charting the expansion of metal detecting as a phenomenon and examining its role within traditional archaeology.